Harry Potter (Daniel Radcliffe) returns for his sixth year at Hogwarts School of Witchcraft and Wizardry. This year, he tries to figure out what Draco Malfoy (Tom Felton) and Professor Snape (Alan Rickman) are up to, who is trying to off Dumbledore (Michael Gambon) and try to get information out of the new potions teacher, Horace Slughorn (Jim Broadbent). Oh, and there's some stuff about kissing and some book. By this point we are six films in and we know pretty much what to expect from a Harry Potter film; the three principle actors will be either good, functional or annoying (Radcliffe, Grint, Watson respectively), the supporting cast of thesps will be fantastic, regardless of how minor or important their roles are (Jim Broadbent as Horace Slughorn is the standout this time around, veering from awkward good-humour to deep personal tragedy in an instance) and the effects will be terrific. And, of course, things will get darker and scarier. What is different this time around is the energy of the film and its tone. One of the major hurdles that confronted the Harry Potter films is that they have been hamstrung by J.K. Rowling's books. Now, I love the books, but any fan would have to admit that, after the major event of Goblet of Fire (the return of Voldemort) the series went into a holding pattern as we waited for the final showdown to come in Deathly Hallows. There were big events in the in-between books, deaths of notable characters and the introduction of the Horcruxes, but they are largely set up for what is to follow. 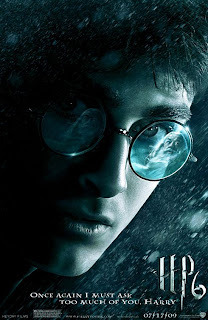 The previous film, The Order of the Phoenix, and this one have both had to deal with being essentially filler, and it is a remarkable achievement that the two stand up so well as films in their own right, even though not very much happens in either film apart from the hinted character deaths. Much of the credit for this must be given to David Yates, who directed both Order of the Phoenix and Half-Blood Prince and is currently working on the two-part finale, The Deathly Hallows. Yates made his name as a director for the BBC, most notably directing the original TV series of State of Play, Paul Abbott's tense and dense journalism drama from 2003. It's quite surprising that he has so adeptly shifted from medium-budget drama to big-budget fantasy, but the series as a whole seems to have benefited from his involvement. Much like Alfonso Cuaron, who directed the best film in the series, The Prisoner of Azkaban, Yates has a keen visual sense, coupled with an ability to square whimsy with darkness and a dramatist's grasp of emotions. Each shot in Half-Blood Prince is lovingly framed, each camera move seems imbued with a sense of the mystical, and every exchange drives the story, with little flab to slow it down. This stems at least in part from Half-Blood Prince being the first film to be released after the books have all been published. Before, directors and writers were unsure what to cut and what to leave in, resulting in either sluggishly paced, overly faithful adaptations (Chris Columbus' first two offerings) or aimless, digressive pieces that kept as much as possible to avoid cutting anything that might be needed later (Goblet of Fire). Knowing now what needs to be in and what doesn't, Yates and screenwriter Steve Kloves are able to focus on what matters and what will serve the final chapter of the story best. This gives the film its energy; gone are the extraneous plot divergences and lack of focus, replaced by a clear plot, even if it is one that is only leading up to an unhappy event. It's two and a half hours long and it didn't feel like it at all. The other element that sets the film apart from its brethren is that it is funny. And not in the ''Oh, aren't those kids precocious'' way that the early films were or the slightly forced style of humour more recently adopted. It is genuinely funny and wittily written. It's like an odd mix of conspiracy thriller, horror and Richard Curtis. When not focusing on attempted murder and manipulation of an old man, the film spends its time detailing the love lives of its main characters. The very, very English repression of their emotions makes for a surprisingly funny comedy of manners, like Jane Austen with wands. Seeing these young people struggle with burgeoning emotions is surprisingly real, given the nature of the film, and apart from the frequent use of the word ''snogging'' (seriously, does anyone use that term past the age of 12? ), a hangover from Rowling's rather awkward depictions of love in her novels, its surprisingly engaging. Hangovers from Rowling's work do cause problems elsewhere, though, as the film comes undone slightly in its final act. It's been a while since I read the book, but I remember that the search for the identity of The Half-Blood Prince was one of the key plot threads and presented Harry with a personal mystery to solve that lasted all the way to the end of the book. Here, it plays an important part in an early scene, gets a cursory mention halfway through, then isn't mentioned until the Prince's identity is revealed. This is not necessarily a bad thing, as I've said, the trimming of fat from the novel makes the film all the stronger, but it is really distracting when Harry mentions the Half-Blood Prince because he is so otherwise absent. It made me wonder if the film couldn't have been improved if they had removed that aspect entirely. It's not like films haven't done that before; where the hell was the Ultimatum in The Bourne Ultimatum? Some fans have complained about changes to the story, particularly the way in which the end was staged, but I can't really find anything to complain about. The lack of a big battle makes the finale all the more powerful, the attack of the Weasly's house is a visually striking set-piece, and Harry's actions towards the end add an ambiguity that was lacking from the book. Six films in and the series has all the right elements that have made it so good in the past but it also seems to have found the director that it needs to bring about a satisfactory conclusion. Here's hoping that Yates can shoulder the burden and give us the climax we all deserve.